On Saturday, Sleaford Cricket Club First XI (Sponsored by Baker Plant Hire) entertained Boston CC at the London Road Ground. Winning the toss, Boston elected to bat and, with the score on 10, Sleaford made the breakthrough, Cameron Hall having Sam Holland caught by Olly Burford for two. Ricky Lovelace and Jonathan Cheer steadied the innings taking the score to 47 before Lovelace was caught by Burford off Angus Youles for 24. This brought Ishan Jayaratne to the crease and he and Cheer advanced the total to 90, with Cheer dismissed for 46 off the bowling of Tom Shorthouse. From this point the innings revolved around Jayaratne, who made his way to 50 as Sleaford claimed the wickets of Yousuff and Musson for two runs each. Luke Gilding made a solid 19 before falling to Adi Sreedharan with the score on 154. Tom Baxter then supported Jayaratne for the rest of the innings, the latter finishing with an undefeated 89 as the Boston innings closed on 200 for 6. For Sleaford, Shorthouse claimed two wickets, with Hall, Youles and Sreedharan taking one each. Sleaford made a positive start in chasing the Boston total until Ross Diver was LBW to Jayaratne for 15 with the total on 21. 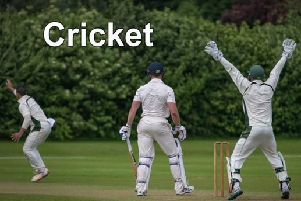 Shorthouse was joined by Andy Hibberd but on 34 Shorthouse was caught by Tom Baxter for nine and two runs later Mountain fell to Paul Deans, giving Boston the upper hand. Both Charlie Roberts (5) and Andy Hibberd (21) were returned to the pavilion, as Boston pressed home their advantage. Burford rallied the innings for a while but lost partners on a regular basis. Only an innings of 18 from Youles offered any real support, as Sleaford were all out for 117 in the 35th over, Burford finishing on 16 not out. This Saturday Sleaford travel to Alford. Sleaford CC Seconds travelled to Boston for a South Lincs and Border League clash on Saturday. After winning the toss, Sleaford invited the home side to bat first and Boston made a very positive start with Ben Troops and Steven Elleray looking comfortable until Elleray was caught by Simon Godby off Giles Goddard for 13. Troops was joined by Matthew Hood and they moved the Boston total forward until Hood fell for 15. Troops continued to play positively taking his total past 50 but he was losing partners on a regular basis. Connor Harbron was most effective of the Sleaford attack, taking four middle order wickets, well supported by Simon Godby with three wickets. This bowling combination reduced Boston to 143 all out in their 45 overs. In reply, Aayush Patel and Godby began positively for Sleaford before Patel was lbw to Michael Troops for nine with the score on 28. Kurt Colyn then joined Godby before departing for 11, the score having moved on to 49. Godby continued to accumulate runs, with good support from Dan Hutson (23), moving past the 50 mark, but with the score on 136 he fell to Damian Lawson for 54 invaluable runs. Matthew Bean (10 not out) and Mason Mansfield (2 not out) saw Sleaford home by four wickets in the 39th over, Sleaford taking 20 points and Boston five. This Saturday Sleaford host Long Sutton at the London Road ground.